We Killed Mangy-Dog and other Mozambican Stories (1964) is one of the best short story collections by a single author in African literature. I would list it among the best in the world. I loved this slim book of seven stories when I first read it about fifteen years ago. It has gotten even better this second time around. In these stories, Luis Bernardo Honwana interrogates the racial, social and class realities of Mozambique. His writing style is sensitive and delicate and each character, whether human or animal, is deeply rendered. His descriptions are vivid and his prose is poetic. Paradoxically, the brevity of his prose coupled with how the stories are crafted results in an expansive view of his Mozambican world. Because, in most of the stories, the reader has to fill in certain gaps or infer a great deal. The author goes to great lengths to show the fragmented nature and the discord in his society as a result of the oppressive and racist Portuguese colonial system. In first story, Dina, a white farm Overseer rapes a young girl within hearing and seeing distance of her African father. It is most shocking and disturbing. The story deals with the emasculation of the African society by its colonial masters. It focuses on Madala, the old father. In the opening scenes, the Overseer delays in heeding the call to lunch and Madala continues to work. Or does he? One is not quite sure whether Madala’s pulling on stalks is real or imagined. Whatever the case, Honwana weaves in a rather sympathetic portrayal of this old man such that when the shameful act occurs, the reader and the other farmhands are both outraged at the pain and dishonor done to this man and his daughter. The reader is led on and expects a rebellion. Instead, another tragedy occurs. In the second story, Inventory of furniture & effects, a young girl relates her family’s possession and describes their living situation. The reader might be lulled into thinking that the story is about nothing much really. But a closer reading allows one to infer intellectual life lived in genteel poverty and a child’s anger at the absence of her father. In Papa, snake & I, a young boy grows closer to his father on a day his father is humiliated by white neighbor. The Hand of Blacks presents different myths about the origin of the pale palms of the hands of Black people. A mother tells her son that black people are equal to white people in every way even though her reality and the community that she lives in say otherwise. The penultimate story, Nhinguitimo, starts with the description of pigeons and the havoc they wreak on harvest, talks of an impending storm but ends with one of the most heart-breaking and poignant instances of land dispossession in literature. The pigeons flight is essentially practical – it sacrifices the grace of a pirouette or the sweep of a curve to the necessity of arriving more quickly. No one remembers seeing a pigeon intoxicated by the caress of the wind, as often happens to the swallow; no one can affirm that, like the vulture, the pigeon indulges himself in the sensual pleasures of gliding through the dense blue space with his wings unfurled; surely too, no one ever heard of a pigeon spending a whole morning combing his stomach for lice, fluffing out his chest, smoothing his feathers, as the lazy secua goose does. Mangy-dog had blue eyes with no shine in them at all, but they were enormous and always filled with tears that trickle down his muzzle. They frightened me, those eyes, so big, and looking at me like someone asking for something without wanting to say it. The narrator of the story, a young boy, feels compassion for and is attached to Mangy-dog. Yet, he will join a band of peers to kill Mangy-dog. Honwana uses this story to describe segregated life under Portuguese rule. Mangy-dog is the most vulnerable member of the community. Here, the plight of the dog represents the plight of black people and in the end, when mangy-dog is killed, one feels that a human being has died. The killing of mangy-dog also marks a rite of passage for the boy-narrator and his peers. Like other stories in the collection that are narrated by children, the child develops with the development of the story. A most disturbing but a truly brilliant story. The stories in this collection are created around a single ideology, character or situation in each instance. As such, their short form belies a depth in perception. It’s as though Honwana took snapshots of life in Mozambique and has rendered them in prose. In this manner then, the ambiguity of many of the stories’ endings is to be expected. The lives of the characters continue on beyond the confines of the story. This is a haunting collection of short stories. Vulnerable is the word that comes to mind when I think of the characters in these stories. 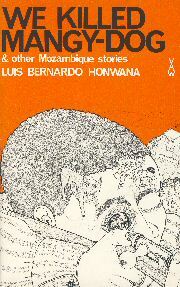 Luis Bernardo Honwana’s name is hardly mentioned when we list the masters of African literature. A great shame because this book has influenced the works of many Southern African writers. A must read and highly recommended. This is a very useful and well-laid piece of analysis and as such i would like to recommend it to all other readers. Thanks for coming by my blog and leaving such a lovely comment! I’ve never read a book that explicitly reveal the life of Africans during the colonial era like Honwana’s We Killed Mangy Dog And Other Mozambican stories. It’s a brillient piece of writing. The short stories are said to be “classical” or at least something to recon in African literature, contrary to this i believe that the style of writing and other stylistic features used are annoying and insignificant especially the last story which is the tittle story, “we killed mangy dog” the repetition is just too much. I hadn’t heard of this author but you sell the book so well. I’ll be adding it to my wish list for sure, thanks. Well, I’ve done my job if you are buying :). Really, it’s a wonderful collection of short stories. Loves of African literature need to read this. Wow! Tying in with some of the poetry I am reviewing on my blog this month, We Killed Mangy-Dog sounds like a harrowing account of the singular stories of colonialism that nobody tells you. It so reminds me of To kill A Mockingbird by Harper Lee. Thanks for sharing. In fact, it’s always good for us West Africans to read Southern African literature that is set during colonial times. We’ve assumed that our experience is typical. Africa’s colonial experiences varies greatly. Look at Ivory Coast and how the France still have a strong presence in that country. Yes, the story Mangy-dog is in some aspects similar to To Kill A Mockingbird . I do hope that you find it in the library. I think you will enjoy the stories. Ohhh: this sounds so good! I’ve put in an ILL request since my library doesn’t have it; the only Mozambique author I’ve read is Mia Couto, and I can’t say I was a huge fan. I’m yet to read my first Mia Couto and he’s on my list for this year. These stories are quite memorable. The first story, Dina , echoed stories on slave plantations and cotton picking farms in the American South. Looking forward to your thoughts because I know that you will try hard to find it through ILL :). AFRICA’S 100 BEST BOOKS OF THE 20TH CENTURY. Indeed, it is a consolation but still, the book is out of print (I think). Thanks for your kind words and support. Until I immersed myself in my Africa Reading Challenge when I read Lilian Momple, Mia Couto, and Pepetela, I have not actually thought of the Portuguese being so racialist as the types we had in South Africa and other places. And this is the power of literature. Sometimes I wonder how we can reconcile their views and actions. They talked of civility yet they were more vile than the wildest animal; brutish in all respect and yet referred to us as savages; evil to the marrow and yet referred to as as pagans. I wonder how they could reconcile their preach of a universally loving God when they implemented divisionist policies and portrayed extreme hatred. I have always wondered how they could partition their minds and their souls to accept these. Whether it does not tear them apart and if, at all, they sit to think deep of their acts.